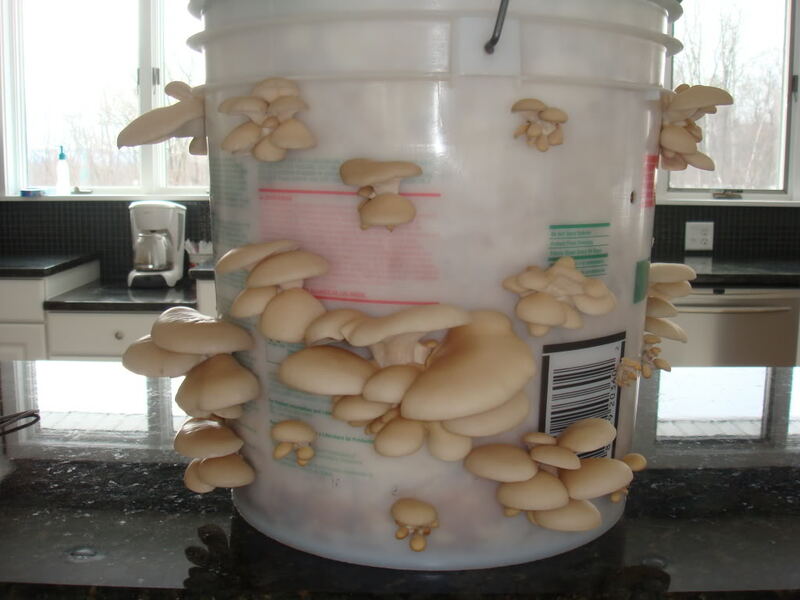 Oyster mushrooms can grow quite large and produce a lot of food using little space. 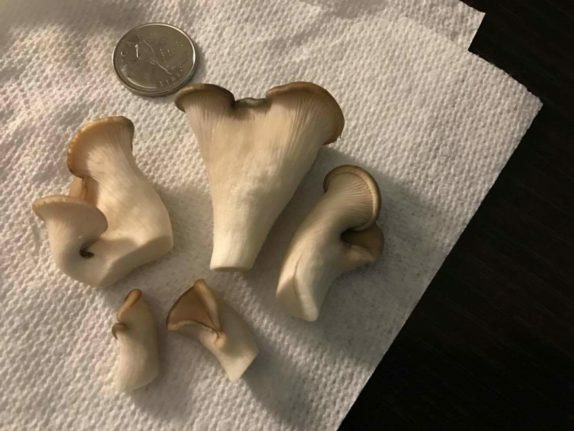 Seeing the success others have had growing large Oyster mushrooms made me eager to try it out for myself. 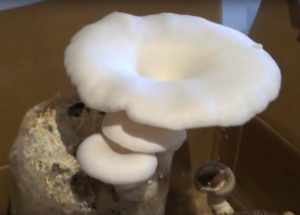 One youtuber’s grow kit showed oysters as big as dinner plates, growing out of something the size of a football. A container to grow the mushrooms in. Our suggestion is of course a five gallon bucket. Spent coffee grounds, up to around half the volume of your container. These can almost always be obtained free from a nearby coffee shop. Dry them or keep them in your refrigerator if you won’t use them right away, so it doesn’t go moldy. A herb drying rack can be great for this purpose. Mushroom spawn. 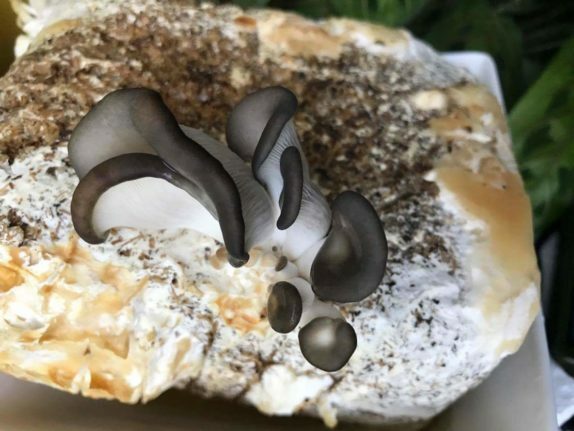 Oyster mushroom spawn can be purchased online from Amazon or from a mushroom lab near you. A spray bottle to gently mist your mushrooms with. Start off by filling your bucket with the coffee grounds you’ve gathered. If the coffee grounds in your bucket are dry, you should add some water to them and let it drain out. Optional: Cover the bucket with plastic wrap, but add some holes to the plastic to keep carbon dioxide from building up. The plastic helps protect them against direct sunlight and keeps the bucket moist. Once the mushrooms start growing, you can remove this plastic. 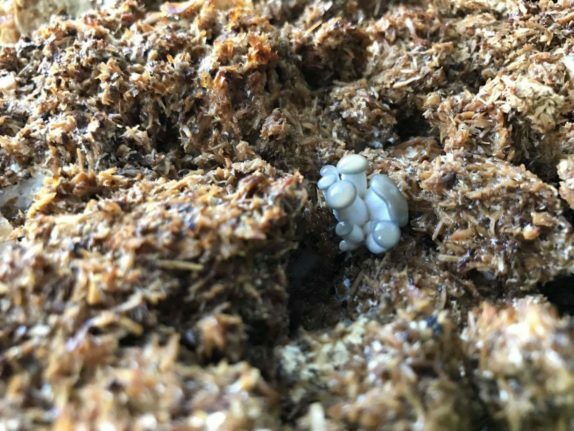 The white stuff you see is your mushroom spawn springing to life and beginning to colonize the substrate you’ve fed to it. 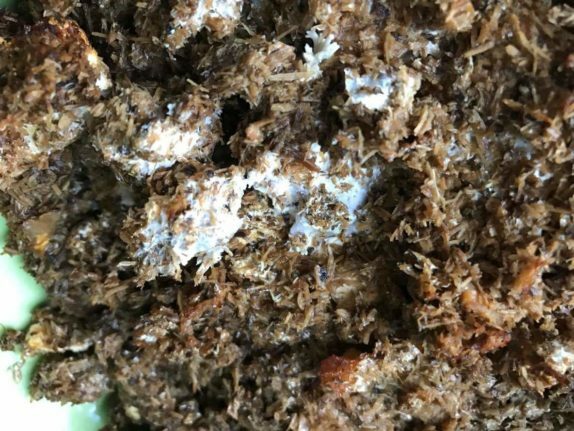 The fibers themselves are called “mycelium” and function similar to plant roots. When you see this, it’s a sign that your work is starting to pay off! I never ate mushrooms before I started growing my own – the chewy texture was not for me! Then I discovered that cooking mushrooms for a long time made them taste very similar to bacon, and suddenly I was very interested in growing as many mushrooms myself as possible! How would you like an automatic bacon maker? You can also grow mushrooms from spores. Spawn is generally preferable over spores however, as spores need an environment that has been carefully sterilized, to avoid contamination. Spawn is less vulnerable. Believe it or not, you can buy mushrooms in the supermarket and get them growing in your own bucket! This method is not very easy, but it’s explained here. The Oyster mushroom naturally contains lovastatin. Lovastatin is a naturally occuring statin, substances that are used to prevent the development of cardiovascular disease. Other mushrooms have other beneficial health effects. Daily consumption of white button mushrooms for example, is thought to drastically reduce your risk of breast cancer. My suggestion is to regularly eat a wide variety of mushrooms. You could also consider taking supplements made from dried mushrooms. One supplement available on the Internet contains a powdered blend of seven different types of medicinal mushrooms. Do you ever throw away cold coffee? Well, why not save it? Check out our page with delicious cold coffee recipes! Can you make shiitake mushrooms in the same way? I’m sure either of them would be willing to answer your questions in more depth. For anyone who happens to come to this post very late, shiitake mushrooms are pickier than oysters and generally want a wood-based substrate. like sawdust. There is a cultivar out there that’s supposed to be un-picky enough to be productive on straw, but coffee grounds will not make it happy because they’re too nutritious and high in nitrogen. This means they will (a) attract more competing organisms like mold (oysters outcompete these pretty effectively, but shiitakes are slower-growing and less aggressive) and (b) yield deformed mushrooms if any (shiitake do not grow normally if the substrate is too nutritious). Hmm… So do Oyster Mushrooms also taste like bacon made the same way? Good question, Shiitakes taste the most like meat of all mushrooms, but all mushrooms have similar properties. If you do this with Oyster, you will not be dissapointed. How long does this setup last? Does it keep going forever and is there an ideal temp to keep them at while growing. The mushroom organism consumes the medium when it produces mushrooms, so it by no means lasts forever. I’ve had smaller kits last a month or two, so I’d expect this one to last 3 or more, but it really depends on how fast you harvest mushrooms. You will need to keep the right temperature; light and humidity levels are also important. In theory you should be able to just add some of the spent coffee grounds to new ones and if the mushrooms are still alive it should colonize the new grounds. says you can use spent coffee grounds to seed logs with oyster mushrooms. Where’s a good place to get 5-gallon buckets, besides just paying full price at the store? See our page on Sourcing Buckets for free and cheap sources. There’s an even better list in the Global Bucket Project’s faq (scroll to the very bottom). Lowe’s branded buckets are food safe. HD buckets may be, as well…I just haven’t had a reason to check. if you have a favorite bar you go to ask them if they have a spare 5 gallon bucket or a bakery will have buckets as well. My first thought about the used coffee grounds was the fact that our local water has fluoride in it. There is a store that sells coffee here but I would hestitate to ask for their grounds (my sister works there so I could get them) due to the fluoride. Even green tea and other food plants are having the fluoride issue due to being irrigated with fluoridated water. Just thought I’d throw that out there…I would love to grow my own mushrooms! Is there any other mediums that could be used instead of coffee grounds? Compost? Yes there are mushrooms that will grow happly in fresh compost ( do not use so called mushroom compost, since that is compost that has already been used for mushrooms – the nutrents the mushrooms need are depleted). I am assuming that you drilled holes in the side to get the mushrooms to grow out of ? and how big were they ?. I wouldn’t go smaller than a half inch or bigger than an inch. I am way late to this discussion but I get icing buckets from the local Dunkin’ Donuts for free and even get to lick the last bit of icing out of the bucket. Sometimes they have as much as a pint left in them! Great idea for using coffee grounds! I will try this! BTW: “spent coffee grounds” and “used coffee grounds” are redundant. Coffee is brewed from ground coffee; the leftovers — the dregs — are coffee grounds. Coffee grounds are always “used”.